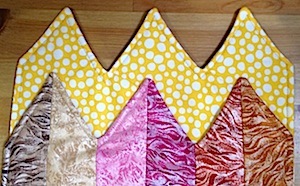 Ever wanted to make your own reversible table runner? 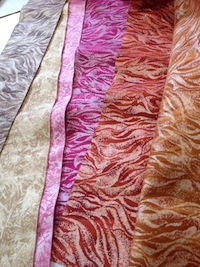 You will work all seams with a ¼” seam. Stitch the six strips together in the arrangement you like placing right sides together remembering to pin to hold the fabric in place. Run a line of stitches down the long side of the strips to join them together. Press with an iron. Trim edges to clear selvedge edges. Next you need to fold work short edge to short edge to find centre & cut in half. Lay the two halves on top of each other with the stripes matching, right sides uppermost. Measure 2.5” in from one short edge and cut across the work. This will create two 2.5″ strips. Set them aside. Measure 4.5” in from one short edge and cut across the work. Again you will create two 4.5″ strips. Set aside. 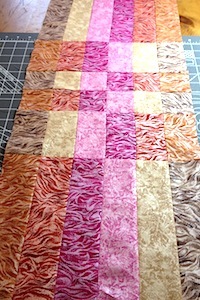 Take your strips and layout your strips so you can see the patchwork taking place. This will help clarify your sewing order. With one of the longer outside stitched strips take one 4.5” cut strip and turn so the coloured stripes are reversed. Place right sides together, pin and stitch in place. Fold open and press. 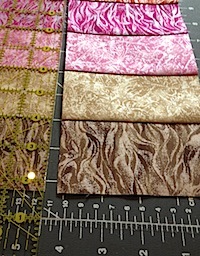 Take a 2.5” cut strip and arrange, right sides together, pin and stitch again. Fold open and press. 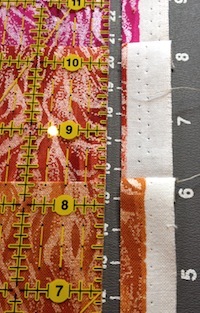 Take the remaining 2.5” cut strip, arrange right sides together, pin and stitch. Fold open and press. 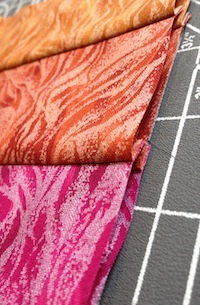 Pressing your seams when patchworking creates a crisp finish to your work. 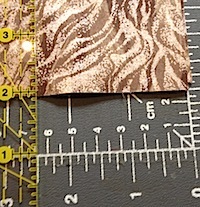 Take the remaining 4.5” cut strip, arrange right sides together pin and stitch. Fold open and press. Take the remaining original unattached strip, arrange right sides together, pin and stitch. Fold open and press. 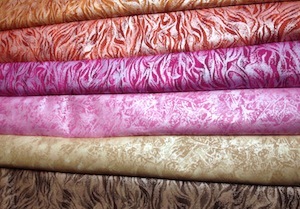 Select your suitable backing fabric. 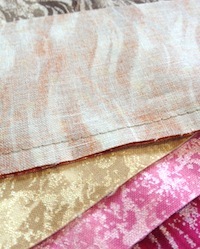 Cut one layer of wadding and backing fabric out : each 33” by 44”. 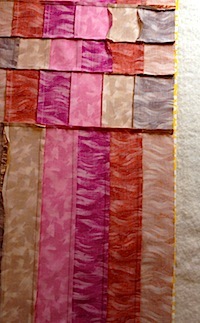 Layer up in this order : wadding, backing fabric right side up & patchworked ‘top’ right side down. Pin together around the circumference of the piece. To create the zig-zag ends, measure and mark a 3” line in from each short edge. 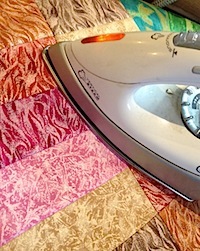 Draw a straight line in a zig zag movement between the 3” mark and the stitched edge on each strip of colour. 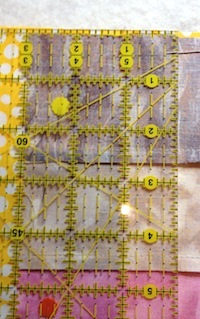 Start midway along a long edge and stitch all the way round the patchwork ending 6” away from the beginning stitch. This will leave an opening to turn your work through. Trim all excess material & wadding away and clip your corners. Ensure the triangular peaks are snipped correctly. Turn through paying attention to your corners. Press with an iron. Now stitch around the parameter of your runner using a ¼” seam. Pay close attention to the opening and make sure you catch the raw edges of the opening shut in your stitching. 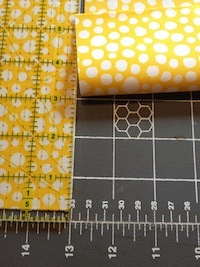 Now you can add quilting lines to your work. Well done! Your quilted patchwork table runner is ready to use and enjoy. Please do share your table runner when you’ve made one.